The web blog of thirty-something “gay girl” Amina Arraf/Abdallah has been removed from public view. The touching story of a half-American lesbian democracy activist living in Damascus was especially tantalizing during the recent media explosion of interest in the Syrian revolution. Discussions arose over LGBT prospects in the new “Arab Spring” , suggesting that Muslim Democracy would be far different than Jewish Democracy in that it would spurn and oppress LGBT individuals in more serious ways than Muslim autocratic dictatorships have. Of course, this makes the assumption that LGBT-identified individuals in the Middle East have never been hassled for writing a pamphlet, saying something uncouth about the government at a bus station, or have had a family member imprisoned for fighting against occupation or despotic government. It draws a shaky line from there to making LGBT-identified individuals natural allies of Mubarak-style regimes, when they could live in peace as long as they were simply Lesbian, not Lesbian-freedom lovers. This line of thinking is dangerous, and puts innocent people in danger. Like the backlash against “Westoxification” in Iran, where Feminists were rounded up as being enemies of the Islamic state thanks to the nominal support they had enjoyed under the Shah, it puts activists at increased risk in a new society by simply suggesting their natural allies are Western values and West-supported governments. By appropriating identities (or identity politics) as a way to further political agendas, the West is indirectly fostering feelings of resentment towards these identities as hostile political classes. Yet hasn’t this always been a problem? By assuming the West can speak for minority groups better than they can speak for themselves, all sorts of atrocities have been sold to well-intentioned people. Israel continues to publicize its treatment of LGBT groups as evidence of its civilized nature – despite critical challenges these groups still face. Yet Israel has no problem speaking for the LGBT Palestinians who surely suffer greatly under the heel of Muslim-ness. However, there is no need to take an imperialist’s word as truth. Thanks to traditional grassroots efforts married to online communities, there are actual indigenous groups (such as Al-Fatiha or RAWA) which work towards just treatment within their own societies. It is best this way because they understand the intricacies and complex structures of their communities far better than ham-fisted imperial interests. So of course voices like Amina’s were welcome in Syrian discourse. This well-written, sexually attractive writer seemed to hit all the happy mediums – including the desire to study Hebrew and work at a Syrian embassy in Israel. This was no Shahbanu speaking. The anonymous nature and the basic format of a blogspot page led us to believe that Amina was an Arab bourgeois English speaker, quite a step up from Youtube queens and Betty Friedan. The story goes deeper, however, when the world discovered that Amina was actually a middle-aged heterosexual white American male, who claimed rather ironically that he felt he had no available audience for his views unless he presented them as coming from a drastically different identity. Another victim of “PC Culture”, Tom MacMaster decided to wear the skin of a lesbian Muslim Arab woman in order to be heard on issues he strangely felt very connected to. This was no simple hoax, either. MacMaster had been posing as Amina for four years, leading one to speculate over his mental and emotional health. He had made her a lesbian, he said, in an attempt “to develop my writing conversation skills … It’s a challenge. I liked the challenge. Whatever the personal reasons behind MacMaster’s identity fraud, further criticism must be leveled at the liberal media apparatus that skyrocketed him to fame, the online medium that can enable such streamlined appropriation of identities, but perhaps most importantly, the criteria by which one is afforded a voice in today’s political culture. 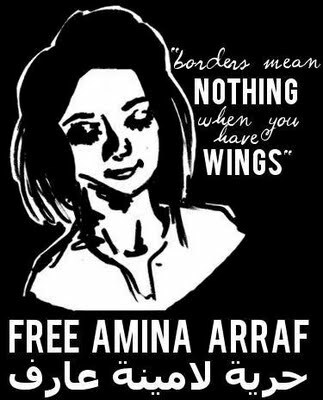 Why is it that Amina’s perfect storm of attributes earns her press space and Facebook support pages over any other Arab activist arrested and tortured by the Syrian regime? Why are certain voices held higher in esteem than the collective voice of the people? Not to say some shouldn’t, but what are the criteria for our choices of who to listen to? There are numerous reasons to criticize governments and revolutions – for instance, the continued crackdowns and endemic corruption of the Egyptian Military government or tanks rolling through villages in northern Syria – without resorting to identity niche standards of “civilization”. Perhaps this is a new dog-whistle politic, a kind of wink thrown over the shoulder to progressive movements. Sure we can harp on and on about the invasion of Afghanistan, but can we really fault the United States for bringing a “better” standard to Afghani women? And even if we don’t, would we want to bring back the Taliban to cut noses and ears again? Here the imperialist right digs the left into a mud pit of confusion and debate while it continues its merciless onslaught against the communities we are wringing our hands over. We might not be running sorties against the Afghan women in specific, but they are just as affected by the bombs and drugs as the Taliban. Say we are running sorties for them, and watch how patriarchal attitudes on the ground entrench themselves. If these minority groups refuse to become vocal tools of imperialism, simply skin them alive and pose as one of them. The combination of her sexual identity, her good looks, her impeccable English, her “moderate” muslimness, and her fantastical (and often sexual) autobiographical posts proved too potent a mix. Amina was a “honeytrap for Western liberals”, as one twitterer put it. Something palatable that they could identify with, the perfect half-white poster child of a brown revolution. Identify with, or – perhaps more truthfully in this case – identify as. Why would Facebook be blocking attempts to link the website www.j30strike.org, claiming that this link has been identified as spammy or abusive? Perhaps it is a technical error or perhaps a user-orchestrated attempt at preventing publicity (see campaign funding if you don’t understand how this works), but it is also just as likely at this time that Facebook itself is blocking attempts at organization due to political motivations. This is not completely new, as attempts have been made in the past to stifle Palestinian organization and protest using the same feature. Hasbara, the informal Israeli corps of internet thugs who badger discussion on issues relating to Palestine, are known for engaging in tactics that will have a discussion or article censored. Yet the J30 strike is not something that focuses on a protest in Ramallah, it is a movement to organize a national public strike in one of the richest and most powerful countries on earth. 1. Facebook should announce whether it has made an administrative decision to block certain politically-motivated pages or links or whether there is a feature available that is being utilized to let users engage in mass-censorship. Of course, it has no obligation to do this and I suspect that even if it does respond, it will not provide a clear and transparent answer. 2. There needs to be a serious re-assessment of social media and its part in fomenting social change. If the company can be utilized to censor political activity, serious efforts need to be made to evaluate the kinds of criteria that will allow it to be “social media-friendly”. Egypt, Syria, Tunisia = Good, UK = Bad? Is social media being used to lend legitimacy to political trends? In addition, recent revelations of “identity forgeries” on the internet (see: Amina Abdallah and “her” blog, Gay Girl in Damascus) must make us re-evaluate the idea of actual human representation online. If humans can have their identities “hacked” to push a social or political agenda through blogs, is it so much to assume they could also be hijacked and used to cast votes or “likes” online, to report “abusive” material? While social media can undoubtedly provide inspiration and tactical strategy, it is still something that is privately owned and traded. Facebook itself is valued at incredible numbers – anywhere from $100 billion to 500 billion dollars – and few ask if the people Facebook bases its value on are even real people with real opinions. Perhaps the most important question is one we must ask ourselves: can private companies really be trusted as reliable stewards of our political development? Does the medium of online discourse really assure you freedom, democracy, or individuality? Edit: I was recently passed along this link to a BBC article, showing that Facebook has offered to “support … in any way we can” the UK government’s efforts to cut domestic spending. Sort of strange to engage the help of a 26 year old American billionaire in selling off the future of UK youth? Downing Street has released footage of a video conference between David Cameron and Mark Zuckerberg as it emerged that the government will seek ideas on spending cuts through a tie-up with Facebook. The prime minister thanked Mr Zuckerberg for his involvement, while the Facebook founder said he felt it was a great way to “engage the public to create social change”.